No physical tickets: Please give your name to the person on the door to gain entry. Dojo Pre-Registrations: This Seminar is a pre-registration seminar. Pre-Registrations must be completed in advance of the course. Black Belts and Club Instructors: Black Belts and Club Instructors are welcome at all sessions and Club Instructors are encouraged to attend all Kyu Class Training. Dan Grading Applicants: Dan Grading Applicants must pay the full applicable course-only fee in addition to any Dan Grading Fees and attend as many sessions as possible. Please note the Single Class fee is excluded. 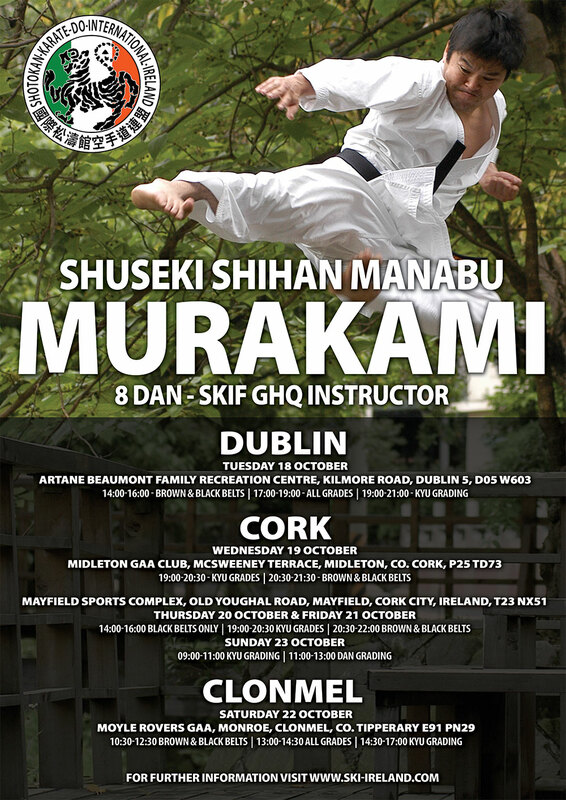 Non SKIF Ireland Visitors: Visitors from other organisations are exempt from paying the €10 Late Fee and are not permitted to take part in any grading without the consent of the SKIF Ireland National Committee. Dojo Instructors: Head Instructor of clubs that have an excess of €400 student contribution for the seminar will have complimentary entry to the seminar. No instructor in the country will have free entry unless their dojo meets this threshold regardless of position in organisation. For this seminar there will be no tickets being issued. No tickets will be issued for this seminar. SKIF Ireland students must have a current/valid SKIF Ireland Licence, (Complete with Photo) to gain entry to the training venues. Please fill out the New Dan Application Form and bring it to the Pre-Grading. The fee for the Pre-Dan Grading Assessment is €15. All Dan Grading Applicatants must pass the Pre-Dan Grading Assessment. All Applicants must be vetted to ensure they meet the requirements for their grading and have completed the required number of seminars with the Japanese Instructors. Failure to meet the requirements for your Dan Grading will see your pre-Dan Application refused.